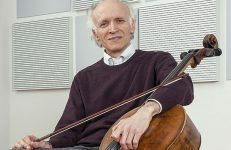 Acclaimed double bassist Edwin Barker previously shared his experiences playing in orchestra. 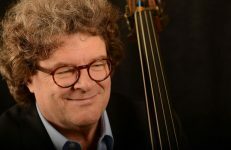 In the conclusion to our interview, Mr. Barker talks more about playing orchestral bass, working with conductors, and the importance of chamber music study, as well as his some of his other pursuits including teaching, recording, and premiering new works. String Visions: What is the most challenging aspect of bass playing in an orchestra? Edwin Barker: One of the biggest issues in terms of bass playing in an orchestral setting is placement of pizzicatos. The basses in an orchestra are not simply providing a harmonic foundation but are also part of the rhythm section. Therefore we must be in touch with what is going on in the percussion section, especially with the timpani, because often our pizzicato gestures are with the timpani. There are three different places to place a pizzicato: at the head of a beat, in the middle of a beat, or slightly on the backside of a beat. The skill is in knowing when to do a specific placement of pizzicato, and it is often my job to lead that decision. For instance, the slow movement of Mahler’s Fourth Symphony has very delicate pizzicatos in the bass section. Those pizzicatos should not be rushed or pushed too much in front of the beat. In this case the pizzicato should be on the gentle back side of the beat. Whereas if you’re playing a pizzicato in a Shostakovich scherzo, those pizz’s should be placed right at the head of the beat. Of course, you have to coordinate these issues with what you’re hearing and seeing from the conductor. String Visions: How do different styles of conducting affect how the orchestra responds? Edwin Barker: We’ve worked with a lot of great conductors and every conductor has their own style, sometimes complete opposites of each other. Some conductors are very physical and intuitive in terms of the way they use their bodies and conduct their beat patterns. They can be very graceful. They don’t really say much when they conduct, showing it all with their hands, and they achieve fantastic results. We have had other conductors who have very minimal beats that don’t show much, and they tend to talk through rehearsals communicating some very sophisticated concepts. Often they attain great results too but for entirely different technical reasons. When a conductor’s beat is very small it forces us to listen to one another very closely with what I call “big ears,” and the balance in the ensemble actually is quite good as a result even though there’s not necessarily much physical information coming from the conductor. On the other hand conductors with very expressive beats who physically show a lot can be very beneficial because the orchestra doesn’t have as much mental work to do, and it is a little easier to play under those circumstances. String Visions: How does an orchestra respond to different conductors? Edwin Barker: If a conductor asks for something we have to give it to him and after a while an orchestra will take on the characteristics of a particular conductor. If it’s a music director, for example, we will start to take on the musical characteristics of the music director. At a certain level though we are really skilled at giving conductors what they desire because we play with such a variety of conductors. For instance, our music director is only with us about twelve weeks a year, but the rest of the time we’re playing with guest conductors. Some of them are really good and some of them are not so good; and yet even with the ones that are not so good, we deliver respectable performances at the very least. With the great ones we deliver really inspired performances, and that goes way beyond just the technique. String Visions: And you experienced many different styles then? Edwin Barker: It’s really quite amazing how many technical styles of conducting we witness. I often wonder if conducting can actually be taught aside from its very basic skills. Certainly the technique of conducting can be taught but there’s a certain quality to it that is quite mysterious, actually. I think that’s why we can have conductors with beat patterns that are totally eccentric but still get fantastic results. However, if they auditioned for a music school conducting program they might not get in based on the way they look. String Visions: What distinguishes a great conductor? Edwin Barker: It’s the way conductors, just like orchestral musicians, respond to what is happening in the ensemble. Conductors must be great musical thinkers but they also need to know when to lead and push the orchestra, when to drive the orchestra and when to let the orchestra play. Sometimes some conductors are over-controlling and that creates problems, while other times they don’t exert enough control. A great conductor knows how to walk that fine line. It’s a similar process from the orchestral player’s point of view. There are times when it’s better for the player not to look at the conductor, and instead depend on the colleagues. We listen to the musical movement. We lock onto the oboe solo and we make sure we’re watching the concertmaster, etc. Of course, that’s the real art of orchestral playing. I think great conductors understand all of this. String Visions: What makes orchestral playing an art? Edwin Barker: It is an art because a really fine orchestral player knows how to take the information from the conductor, integrate into her or his musical style and coordinate it with the rest of the orchestral ensemble. In a great orchestra one can feel confident because it is clear that the oboist, the clarinetist, the flutist, the timpani player, etc., all know what they’re doing. The bassists can depend on them just as they can depend on the bass section. I think this helps the conductor as well. In orchestras that are not as skilled, maybe that’s not quite as easy to do. You may not be able to depend on what you’re hearing in the ensemble. String Visions: What do you think have been the biggest changes in orchestras in recent years? Edwin Barker: The most obvious change is that there are many more women in American orchestras. Also, I think the level of bass playing is a lot higher than it used to be, for sure. It used to be that in bass sections everywhere intonation was really questionable, but the level of teaching and playing the bass has become so high in the last generation. The way teachers are now teaching the instrument, the playing standard is at the level of other strings in terms of the quality of intonation, tone production and articulation and musical sophistication. 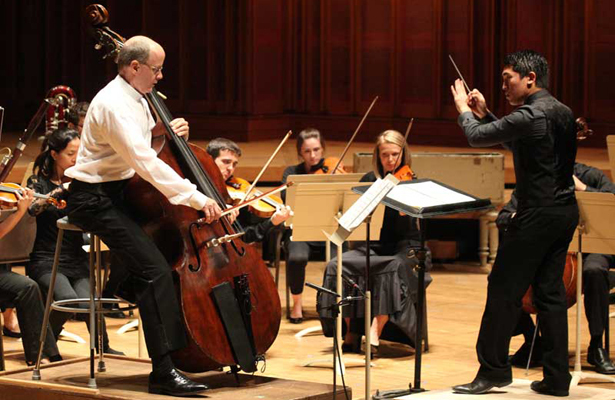 String Visions: How important is chamber music experience for orchestral musicians and why? Edwin Barker: It’s extremely important. The study of chamber music is one of the best ways a performing classical musician can receive training. It teaches instrumentalists how to blend with each other, find the right shade of intonation, and listen and react to what is happening in the music. I always want my students to study and perform chamber music because in terms of ensemble experience, it is the most important thing they can do to prepare for a really functional and satisfying life in an orchestral setting. Instrumentalists need to apply their learned chamber music skills to the orchestral experience. If they just sit back and only play the notes they will likely be musically unhappy and risk making their colleagues unhappy also. Listening, reacting, understanding and blending with respect to intonation, articulation and tone color make for a better ensemble experience. The audience notices high quality in terms of the way the orchestra plays, colleagues all notice it, and the player I think has a happier life in that setting. The orchestra really should be treated and thought of as a giant chamber ensemble. The best orchestras do that; they have that sense. That’s very important. String Visions: You have given the premiere of several major works for Bass. Tell us about the experience of working with a living composer. Edwin Barker: Some composers are really good at taking the performer’s suggestions. If something in the writing is really unidiomatic or problematic they will be very happy to accommodate a knowledgeable performer in order to make the piece playable and sound good. Others have a very clear and fixed internal concept of what they wrote and want to hear, and even though the writing is technically difficult and significant portions of the piece are impossible to play, sometimes composers are not as willing to compromise on an idea. I have always thought the job of the performer is to figure out how to play whatever the composer wrote. Even if something is really ridiculous, my feeling is if the composer wrote it, I will make my best effort to figure out how to play it. Sometimes I may end up falling on my sword, but I feel it’s my obligation as a performer to try to do what the composer wishes. I’ve been fortunate that the composers I’ve worked with have all been fairly accommodating and appreciative of the fact that we were collaborating. I have had a particularly happy relationship with James Yannatos and Theodore Antoniou, both of whom wrote pieces for me that I had the pleasure of recording. James Yannatos has written several pieces for me including his Concerto for Contrabass and the Variations for Solo Contrabass. 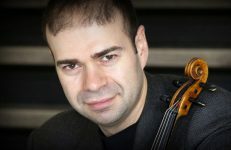 Theodore Antoniou wrote his Concertino for Contrabass and Orchestra for myself and the Pro Arte Chamber Orchestra. He also conducted it. In the Concertino Theodore composed some very thorny passages and at one point I did ask him if he would be willing to change a few things. Initially he was hesitant so I did make a strong attempt to try to do what he asked. On subsequent performances, I think he realized some things worked better by doing them a little differently. He was happy to entertain a few little modifications on his piece. String Visions: How do you feel about “faking” passages in these difficult pieces? Edwin Barker: When I do a performance of difficult pieces I try not to fake passages in order to make them easier. I did a performance of Gunther Schuller’s Concerto for Double Bass and Chamber Orchestra after working on the piece with him. The piece isn’t played that much. It’s probably the hardest piece I’ve ever done by far, actually. I must have spent two years learning it with a couple of hours on every measure. I did that because I knew that Gunther wanted it played the way he wrote it and it was my responsibility to do that. I didn’t fake any portion of the piece. The notes were played even though some notes were not played perfectly. I am willing to admit that it wasn’t perfect, but there was an effort made to actually play it as he wrote it. I think I succeeded pretty well with that. String Visions: Do you feel it is important for young musicians to be competent in extended techniques required for new music and to play this music? Edwin Barker: I do think it’s important for young musicians to be somewhat versed in extended techniques for new music. The young students I’ve been exposed to haven’t had enough training in playing contemporary music or even in playing music from the sixties and seventies. 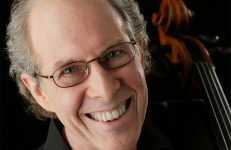 Frankly, a lot of students are clueless about how to approach that repertoire, whether it’s twelve-tone or free atonal writing, or writing that has extended techniques, or music where one has to sing and play at the same time, for example. I think it’s important for students to be able to know how to approach that music and work through the problems that those pieces pose. They need to have the flexibility to be able to do that. I require my students to play some contemporary or modern music. We have lengthy discussions on how to approach playing the repertoire and what is entailed in playing and communicating the music well. Generally speaking, students are not taught enough about new music. String Visions: Why do you think that is? Edwin Barker: I don’t know. When I went to school at the New England Conservatory in the seventies, Gunther Schuller was the president there at that time and we had a very strong contemporary music component in our education. We had to study contemporary and Twentieth Century repertoire, and we performed it a lot in the ensembles. As a matter of fact, the school had a contemporary music ensemble that specialized in playing modern music. I wonder if schools do that as much anymore. I also wonder if teachers spend meaningful time teaching new music. I’m just basing this on what I’ve seen of students who have come to work with me, even students who are coming to study for post-graduate degrees. People who have already had a fairly substantive musical education still tend to be fairly clueless about how to play modern music, and I’m surprised because we were up to our ears in it when we were at the New England Conservatory in the seventies. String Visions: Have there been specific teachers or mentors that had an especially large impact on your development as a musician? Edwin Barker: I have to say all of my teachers; I can’t give them enough credit. My first teacher, Angelo LaMariana, was the one that got me going, and he taught me to approach the bass from an upper string player’s perspective. After Angelo LaMariana I studied with Peter Mecurio in the Los Angeles area for one year and three summers at the Music Academy of the West in Santa Barbara. His style of teaching was very different from LaMariana’s but it was very effective and he was a big believer in developing technique, especially of the bow arm. So he gave me a lot of bowing studies to do in either etudes or scales studies. He had a warm personality and an encouraging style that had a big influence on me. During my high school years I also studied briefly with Richard Stephan, who was associated with the Crane School of Music in Potsdam, New York. And of course I had early and very inspirational exposure to Frederick Zimmermann. My main primary teacher at the conservatory level was Henry Portnoi, who was the Principal Bassist in the Boston Symphony. I studied with him in the New England Conservatory and he was extremely musical and analytical and had an almost scientific way of approaching not only technique but also music making and phrasing. His way of teaching wasn’t just to say, “do this” and “here’s how you do it”. He would say, “you have to do this and here’s why you do it”. That was very good. Lessons were always extremely intense. He had an approach to the work ethic that doesn’t seem to occur as much now. If the student came in to a lesson unprepared, he would throw him out of the lesson and say, “You’re wasting my time. Don’t come back until you know this.” Completely no nonsense and that was a great motivator for me. I did spend one summer at the Blossom Festival studying with David Pearlman who was principal in the Cleveland Orchestra. His technical approach was almost the complete opposite of Henry Portnoi’s and I learned some valuable information that incorporated into my playing as well. Basically it’s an issue of incorporating as much as possible from all teachers and finding a way to integrate it and make it your own. If I hadn’t studied with these people, in particular Portnoi, I don’t think I would have gone quite as far and fast as I did. Portnoi really challenged the student in every lesson and for me that challenge was very motivating. String Visions: What have you learned from teaching that has informed your performing? Edwin Barker: I learn things from teaching all the time. For me part of the issue is finding a way to verbalize concepts that I’ve internalized to the point where I take them for granted. In the process of organizing and verbalizing these approaches and concepts, I must analyze everything I am doing. Sometimes I discover a better way to do something. In this way teaching helps my playing; it’s a way of forcing fresh analysis on my playing. String Visions: What about teaching do you enjoy the most? Edwin Barker: It’s great working with the students. I particularly like teaching at Boston University. I find that the level of discourse with the students there is quite high. They have interests in things other than music, and I enjoy that. I find that the students I’ve been fortunate to teach are very motivated, centered and focused. I like working with people like that. I like people who are very serious about what they’re doing. They are not, as Henry Portnoi would say, “wasting my time.” That’s good! I’m serious about what I do, and I expect my students to be focused on their studies. I enjoy working with them. String Visions: How diverse do you think students’ listening repertoire should be? Should they only be listening to bass recordings or should they be listening to everything under the sun? Edwin Barker: Oh, heavens no! Not bass recordings! Yes, listen to them once in a while but in terms of only bass recordings, absolutely not. It’s important to listen to a lot of music. I can only speak to the realm of classical music. There are all kinds of music, and I think if something generates a strong interest, the student should listen to it. 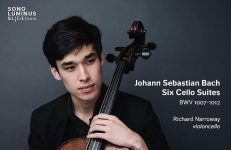 In terms of classical music, it’s important to listen to great string playing such as the great violinists, cellists, and violists, and not just of this generation but also of past generations. It is also important to listen to great singers. Bass students need to spend time doing that because the vocal model is what we do as string players. Listen to wind players as well. I happen to be a fan of the French horn, for example, and I have a lot of horn recordings. Of course, listen to orchestral recordings and chamber music and string quartet literature. Not just the standard repertoire played in auditions but also other great repertoire. I am a fan of Charles Ives’ music. Ives is not really standard repertoire, but I try to encourage my students to listen to him and others. One other thing I would recommend is for students to spend time going to master classes of instruments that are not theirs. Especially if they can attend vocal master classes, for example. That’s how to learn to develop a strong musical sensibility. I’m an advocate of listening to and digesting elements of period practice and style. Thus, listen to period recordings. After that is done, go listen to a few bass recordings. String Visions: Can you share some of your most memorable moments from your orchestral career? Edwin Barker: Well, I have never really thought about it. There’s so many! Of course there are inspired moments and I can list some now but then I’ll think of even better ones later. I always remember my first performances with ensembles. I remember the first performance in my first full-time professional job with the Chicago Symphony. I was just out of school and I started at their Ravinia summer season. The very first performance was Tchaikovsky’s Fourth Symphony, which they started to rehearse. The rehearsal consisted of starting each movement and that was it. Then the next day we performed it. That same week we performed the Schoenberg Gurre-Lieder and of course that’s where we spent all of our time rehearsing. It was interesting because the conductor was a young musician by the name of James Levine. He is now our music director here in Boston. I also remember my first rehearsal with the Boston Symphony. They were going to perform Mahler’s First Symphony, which has a fairly significant bass solo at the beginning of the slow movement, and I had to play that on my first day there. At the end of the week it was recorded with Deutsche Gramophone. I remember some really wonderful performances: Mahler’s Fifth with Solti was really outstanding and amazing. Seiji Ozawa’s Berlioz’s Symphonie Fantastique was always exciting. The Boston Symphony performed the Berlioz Damnation of Faust in Salzburg with Ozawa and soloists, and the audience went nuts afterwards. Long after the orchestra had left the stage, and I had actually gone down and changed my clothes, put my bass away, and was exiting the building, the audience was still giving Ozawa and the soloists curtain calls. This must have been about twenty minutes later. A great 2-part interview with a great performer and teacher. Edwin Barker is one of the musicians I admire most: he is also a wonderful person, and his section in Boston must feel like the luckiest people in the world. I am sending this interview to all of my students, and reading it they will learn some of the endless mysteries and fascination of orchestral playing. George Szell spoke of it as Ed speaks of it: “Orchestra playing is large chamber music.” If you think of it in that way and participate in it and enjoy it like that, you will never have a dull day in music. Many warm thanks and congratulations for this beautifully phrased interview…. Appreciate your comment Orin. You’re absolutely right Mr. Barker is a phenomenal individual, and we’re humbled and grateful that he took the time to sit down with us. Glad you enjoyed the interview and thanks for sending it over to your students. We hope they enjoy the read as well! an in-house bar or restaurant. Corruption is just as rampant as in any other large city. is abounding with many such shopping malls. Performing these exercises on a regular basis will convert your skills in speaking to a level most will find surprising. “Article Source: author grants full reprint rights to this article. To make them stick to their logs use cream cheese, hummus, or a bean pate if you wish. All this means that China, a country well worth discovering. running through it and is dominated by mountains, forest and other treasures. ser aplicada no trading esportivo. bookmarked! !, I really like your webb site! saber que as fotografias cairiam na web. Find under the step-by-step course of to create an online service from the java class and easy methods to test it using the built-in weblogic server that comes bundled with the JDeveloper 11g. So many great musicians and we always have something more to learn. genuine arguments and telling all regarding that. Leave a Reply to スーパーコピーブランド格安販売店はこちらへ！品々の激安価格に持ったスーパーコピーブランド 代引きの新作はお客様に提供されます。安心、迅速、確実、お客様の手元にお届け致しま Click here to cancel reply.